Early Derby Marks and newer Royal Crown Derby base marks. 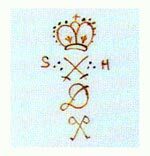 Derby marks are many but most follow the same theme, with a cypher surmounted by a crown. Dating early Derby is slightly more difficult than the more modern Royal Crown Derby, but dating Derby porcelain is much easier than many of the early English porcelain factories. Derby porcelain was produced at three main factories. And; Osmaston Road from 1877 to modern times. In 1775, George III granted Derby Porcelain the right to incorporate the crown into the Derby backstamp. Derby Chelsea interlinked D and Anchor mark. William Duesbury fully acquired the famous Chelsea Works factory in 1770 and the Chelsea anchor mark and Derby ‘D’ were merged to form the Chelsea-Derby mark. during the firing of the glaze. Painted mark with Crown and D.
Painted mark with Crown above crossed batons and D below. Large crown in red with large D below. Robert Bloor took control of the Derby factory in 1811 and immediately began to build a team of very fine painters. Later variation of the Bloor Derby Mark with crown in the centre. Derby also used incised marks on their early figures, consisting of No and a number. 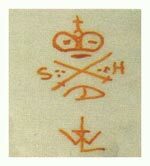 The mark pictured showing No314 on a seated figure. A group of former employees set up a factory in King Street in Derby, and continued to use the moulds, patterns and trademarks of the original business, but not the name. No mechanical processes were used and no two pieces produced were exactly the same. Among the items preserved was the original potters wheel used by the Duesburys. Showing Crown above crossed batons with S and H at either side. D below and interlinked WL beneath. 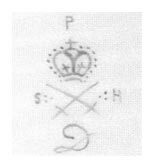 Showing Crown above crossed batons with S and H at either side and D below but with revised Larcombe monogram showing the L rising into a P.
Showing P above Crown above crossed batons with S and H at either side and D below. Showing Crown above crossed batons with S and H at either side. With D below and crossed P’s below. In 1877, Royal Crown Derby Porcelain moved to an impressive new factory at Osmaston Road and introduced new marks. Showing Crown above interlinked D’s. First mark to use the interlinked D’s below the crown. More often seen with the year cypher below. Showing Royal Crown Derby in a circle above a Crown above interlinked D’s with year cypher below. Showing Royal Crown Derby above Crown above interlinked D’s with MADE IN ENGLAND below in red. This mark showing pattern number 2451. Showing Royal Crown Derby above Crown above interlinked D’s with MADE IN ENGLAND below in blue. This mark with pattern name KENDAL and design Registration Number for 1909-1910. Wartime mark usually in dark green and without year cypher. Showing Crown above interlinked D’s above ROYAL CROWN DERBY – MADE IN ENGLAND – Design Reg. No. This example with retailers details for ‘Plummer of New York’ and roman Numeral based year cypher of XVII for 1954. Showing Royal Crown Derby above Crown above interlinked D’s with MADE IN ENGLAND (BONE CHINA) above pattern number and name. Showing DERBY CHINA above crown with interlinked D’s above ROYAL CROWN DERBY – ENGLISH BONE CHINA. Often including pattern name and number and with Roman Numeral year cypher. The crown and interlinked D’s are now within a circle of ROYAL CROWN DERBY – ENGLISH BONE CHINA. The © copyright character below the Derby logo. This mark including popular Imari pattern number 1128 and with Roman Numeral year cypher for 1982. Derby porcelain also included a date cypher with most base marks produced at the Osmaston Road factory. This took the form of a small graphic illustration below the main mark and later, from 1938, a Roman numeral. The V of 1904 can be confused with the Roman V of 1942 as can the X for 1901 and the Roman X for 1947. To differentiate both the earlier X and V you should check for ENGLAND or MADE IN ENGLAND, the later piece will have MADE IN ENGLAND. All Royal Crown Derby marks can be attributed to one of the three Derby factories. Simply compare the style of the Derby mark and date the year cypher used to come as close as possible to the date of manufacture. After dating you will want to then attribute the piece to an individual artist, if possible, and then assess how rare or sought after it may be based on it’s age and the popularity of the artist. Derby figures with the incised mark ‘N‘ are particularly sought after and date to between c1765 and c1785. The early Chelsea Derby marks can be attributed to the Nottingham Road factory and date to between c1770 and c1784. Some particularly fine painters worked at the King Street factory including Fredrick Chivers, Sampson Hancock, W Hargreaves and George Jessop. Any Derby piece by the above artists would be of great interest to serious Derby collectors. Collecting Derby Porcelain … try to focus your efforts on a particular factory, style or artist. Accumulating a good quality collection from one period or by one artist will help you become an expert in your chosen field.